Hand-built in our Central Virginia woodshop, the Esmont natural platform bed marries traditional construction and clever design with a unique, Patterened-Slatted or Solid headboard. Create a simple pattern with included spacers, or opt for a solid appearance. 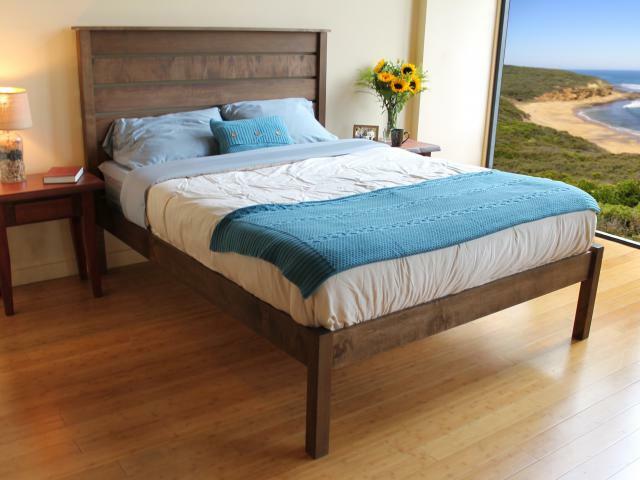 Like our flagship model, the Esmont natural platform bed features an all-maple frame with closely-spaced poplar slats and solid steel, mortised-in corner brackets. Traditional mortise-and-tenon joinery is also used for optimal strength and durability. Choose zero-VOC linseed oil; zero-VOC walnut, cedar or mahogany finish; or natural unfinished. No lacquers or varnishes are used. Simple assembly; no tools required. We often run promos on these frames. Call a sales associate or come in to our Salt Lake Showroom for extra discounts when avail.! Avail. in a Slatted "Patterned" or Solid Headboard - Simply decide which style when assembling!